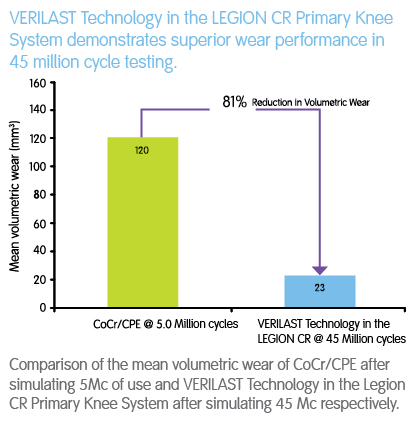 How long do you want your knee implant to last? Just like the surfaces of your natural knee joint, friction created when the surfaces of a knee implant rub together can cause these surfaces to wear down over time. This type of implant wear is a leading cause of knee replacement failure. So while we cannot say we've eliminated implant failure due to wear, we believe our 20 years of dedicated research is paying off for patients who want to rediscover their active lives. 1 Elena Losina, Ph.D., co-director, Orthopaedic and Arthritis Center for Outcomes Research, Brigham and Womenï¿½s Hospital, Boston; William J. Robb III, M.D., chairman, Department of Orthopaedic Surgery, NorthShore University Health System, Evanston, Ill; Feb. 10, 2012, presentation, American Academy of Orthopaedic Surgeons, annual meeting, San Francisco. 2 Testing concluded at 45 million cycles. ISO 14243-3 defines test completion at 5 million cycles. 3 Goldsmith AA et al., "Comparative study of the activity of the total hip arthroplasty patients and normal subjects". J Arthrop, (16)5:613-619, 2001. 4 Morbidity and mortality weekly report, 55(40):1089-1092, October 13, 2006.(http://www.cdc.gov/mmwr/preview/mmwrhtml/mm5540a2.htm?s_cid=mm5540a2_e. Accessed on October 30, 2009). 5 Gioe TJ et al., "Knee Arthroplasty in the young patient - Survival in a community registry". Clin Orthop Relat Res, 464:83-87, 2007. 7 Wimmer M A et al., "Joint motion and daily activity profile of total knee patients in comparison with the ISO knee wear simulator". Paper 0159, 48th ORS, 2002. 8 Huddleston J I et al., "How often do patients with high-flex total knee arthroplasty use high flexion? ",Clin Orthop Relat Res, 467:1898-1906, 2009. 10 R. Papannagari, G. Hines, J. Sprague and M. Morrison, "Long-term wear performance of an advanced bearing knee technology," ISTA, Dubai, UAE, Oct 6-9, 2010. What is OXINIUM◊ Oxidized Zirconium?